Choose the cooking time 10 min. 15 min. 20 min. 25 min. 30 min 30 min. 35 min. 40 min. 45 min. 50 min. 60 min. 90 min. Cook the red port with 3 tbsp. of sugar and the cinnamon stick and reduce to the consistency of syrup. Preheat the oven; (electric: 200˚C /convection: 175˚C / gas: mark 3). Cut the figs crosswise at the top, cutting in up to a little before halfway. Grate the Landana goat cheese OLD and divide it over the figs. Place the figs in the oven for about 6 minutes. Dissolve 50 grams of sugar with the butter until it colours lightly. Add the walnuts and caramelise the nuts until golden brown. Remove a few leaves from the chicory and drizzle a little olive oil over them. Take the figs out of the oven and let them cool to lukewarm. 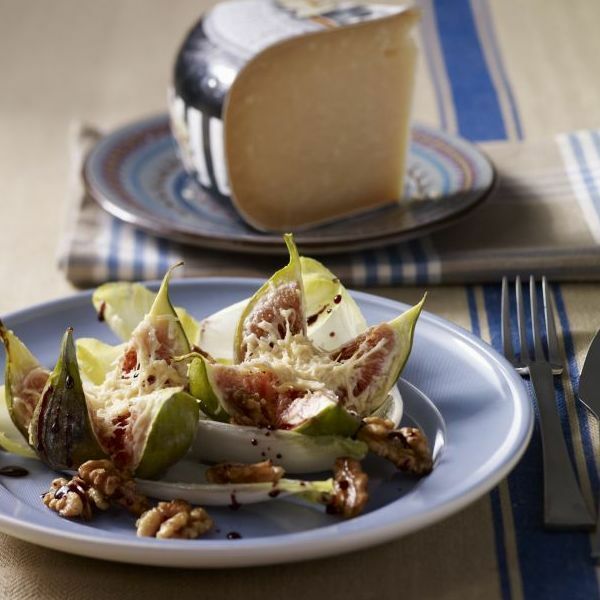 Lay a few chicory leaves on each plate and serve the figs with the walnuts on top. Garish with the port syrup.